Joints are susceptible to a number of diseases, including arthritis. Any condition that damages a joint may produce arthritis. Causes of these conditions may include degenerative disorders, trauma, infections, and immune disorders. Many pets develop some form of joint disease during their lives. It can be mild, even unnoticeable to the pet owner, or it can be debilitating, severely affecting the pet's quality of life, or even causing complete lameness. The majority of cases fall somewhere in between. While some pets may develop joint disease in the first half of their lives, signs usually do not appear until the latter half of life, which varies depending on your pet's breed. Dogs are more susceptible to arthritis than cats, and the larger dog breeds are more vulnerable than smaller breeds. The most common signs of joint disease include stiffness, limping, or favoring a limb - particularly after sleep or resting, inability to rise, reluctance to jump or even climb stairs, and noticeable pain. There are many diseases that affect the joints of dogs, so many, in fact, that there are 10 major classifications. Depending upon whom you talk to, the terms 'osteoarthritis' and 'degenerative joint disease' may or may not be used to describe the same thing. In this discussion, we will use the terms interchangeably. Degenerative joint disease is characterized by the loss of the smooth cartilage that covers and protects the end of the bones in a movable (synovial) joint. The cartilage has no nerves so when it touches the cartilage of another bone, there is no pain. When the cartilage wears away, the bone is exposed. The bone does have nerves so when the two bone ends in a joint touch each other it results in pain and inflammation. In degenerative joint disease we also see small bony projections (osteophytes) form on the bone that is close to the joint. This adds to the pain. Degenerative joint disease is progressive, meaning it continues to get worse. Degenerative joint disease can occur as a result of wear and tear on an otherwise normal joint and occurs as the dog ages. This is called primary degenerative joint disease. Degenerative joint disease may also occur as a result of another condition affecting the joint such as hip dysplasia or elbow dysplasia. Then it is called secondary degenerative joint disease. Certainly any dog with a congenital joint problem, like dysplasia or patella luxation is going to be more prone to developing degenerative joint disease. Dogs who have had injury to a joint such as a fracture involving the joint, or a ruptured anterior cruciate ligament in the knee will be more likely to develop degenerative joint disease. The symptoms of degenerative joint disease will vary as to which joints are involved, the age of the dog, and the severity of the disease. In general, the first symptoms may be an altered gait since the dog will try to put more of its weight on the unaffected limbs. There may be muscle atrophy (reduction in the size of the muscle) in the affected limb because the dog is using it less, or at least putting less weight on it. For instance, in a dog with hip dysplasia involving both hind limbs, the muscles of the hind limbs may be thin, whereas, the muscles of the chest and shoulders may be increased in size because the dog is putting more weight on the front legs. Many times the dog may find it difficult to get up after lying down and appears stiff. The dog may be unable to jump up into the car. Many dogs find it difficult to go up or down stairs. Depending upon the amount of pain the dog is experiencing, there may be changes in appetite and behavior (e.g., the dog may go off by itself more often). The joints are generally not swollen and the pain is the dull aching type, so dogs do not often vocalize or cry out in pain. Some dogs will lick or bite at the area that is painful. Some will seek out warmth or soft places to sleep. The veterinarian will obtain a good history of the dog's signs from the owner and perform a complete physical exam. Radiographs are taken, and further laboratory tests or more detailed exams of the affected joint(s) may be performed. Degenerative joint disease can be treated medically and surgically. Some forms of degenerative joint disease can be treated with surgery. For example, hip replacements in dogs with hip dysplasia are becoming more common. Other procedures can also be performed but their success rests upon how many bony changes have occurred in and around the joint. Please see the article on the specific joint disease for extended discussion on the surgical treatment options for that disease. What is the prognosis for dogs with degenerative joint disease? Degenerative joint disease is progressive - it will continue to worsen. There are ways we can medically treat the disease to slow down the progression and many dogs respond well and can live comfortably for years. In more severe cases, surgery may be performed including actual joint replacements. In these cases, the recovery is usually very good. A dog from one of the smaller breeds runs across the yard chasing a tossed ball. In mid-stride, he yelps in pain and pulls his left hind leg off of the ground. After a second, he continues limping on in three-legged fashion. After ten minutes, the rear leg drops back down to the ground and he uses it normally. This episode occurs maybe once a week. It never really seems to bother him that much -- a yip of pain, a short period of lameness, and in a few minutes he is back to his old self. Typically, he is a small or toy breed such as a Lhasa Apso, Pekingese, Pomeranian, Poodle, or Boston Bull. A luxating patella may affect some animals much more severely. They may hold the leg up for several days and show considerable discomfort. Dogs who have a luxating patella on both hind legs may change their entire posture, dropping their hindquarters and holding the rear legs farther out from the body as they walk. Those most severely affected may not even use their rear legs, walking by balancing themselves on their front legs like a circus act, holding their hindquarters completely off the ground. The patella is the bone we know as the knee cap. A groove in the end of the femur allows the patella to glide up and down when the knee joint is bent back and forth. In so doing, the patella guides the action of the quadriceps muscle in the lower leg. The patella also protects the knee joint. Looking at the lower front portion of the femur (the thigh bone) in a normal dog, you will notice two bony ridges that form a fairly deep groove in which the patella is supposed to slide up and down. These structures limit the patella's movement to one restricted place, and in so doing, control the activity of the quadriceps muscle. When the patella luxates from the groove of the femur, it usually cannot return to its normal position until the quadriceps muscle relaxes and increases in length. This explains why the affected dog may be forced to hold his leg up for a few minutes or so after the initial incident. While the muscles are contracted and the patella is luxated from its correct position, the joint is held in the flexed or bent position. The yip is from the pain caused by the knee cap sliding across the bony ridges of the femur. Once out of position, the animal feels no discomfort and continues his activity. In certain breeds that have extremely short legs such as the Basset Hound or Dachshund, patellar luxation is thought to be secondary to the abnormal shape of the femur and tibia. The curvatures of the bones in these breeds work in conjunction with the forces of the quadriceps muscles to displace the patella to the inside. 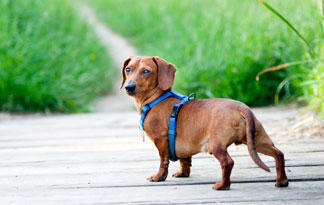 Please do not misunderstand -- not all members of these breeds are affected with patellar luxation, only a small portion. Surgery can alter both the affected structures and the movement of the patella. The groove at the base of the femur may be surgically deepened to better contain the knee cap. The knee cap itself may be "tied down" laterally (on the outside) to prevent it from deviating medially (toward the inside). The bony protuberance at the site of the attachment of the quadriceps tendon on the tibia may be cut off and then re-attached in a more lateral position. All of these procedures work well and the type performed depends on the individual case and the clinician. The animal should respond quickly after surgery and is usually completely recovered within thirty days, using his legs in normal fashion. It is never easy to see a beloved pet and friend in pain. Medical treatment of degenerative joint disease (osteoarthritis) has greatly improved in the last several years thanks to the introduction and approval of several new drugs and supplements. And while there is not yet a cure for this debilitating disease, there is much you can do to control the pain, make your pet comfortable, and perhaps slow down the progression of the symptoms. Weight management is the first thing that must be addressed. All surgical and medical procedures will work much better if the animal is not overweight. Considering that up to half of the pets in the U.S. are overweight, there is a fair chance that many of the dogs with degenerative joint disease are also overweight. Getting the dog down to his recommended weight and keeping it there may be the most important thing an owner can do for their dog. This may be the hardest part of the treatment, but it is well worth it. Very few dogs can drive to McDonalds, work a can opener, or open the refrigerator, so you, the owner, are controlling what your dog eats. If you feed your dog less, it will lose weight. Exercise is the next important step. What we are trying to accomplish here is to restrict the amount of exercising, yet still maintain adequate movement to increase or maintain muscle strength. Young, active dogs are going to need to be restricted to walks on the leash. Swimming is an excellent way for dogs to maintain muscle mass, but place minimal stress on the joints. Older dogs should also participate in these activities to a lesser extent. Jumping in all forms is bad for dogs with arthritis. While watching a dog play Frisbee is very enjoyable and fun for the dog, remember that it is very hard on a dog's joints. Remember, it is important to exercise daily; only exercising on weekends, for instance, may cause more harm than good if the animal is sore for the rest of the week and becomes reluctant to move at all. Slip a sweater on your dog. Arthritis tends to worsen in cold, damp weather. A pet sweater will help keep joints warmer. You may want to consider keeping the temperature in your home a little warmer, too. Provide a firm, orthopedic foam bed. Beds with dome-shaped, orthopedic foam distribute weight evenly and reduce pressure on joints. They are also much easier to get out of. The orthopedic beds we offer are very good choices. Place the bed in a warm spot away from drafts. Next to a heat register is best. Your veterinarian or the veterinary staff can show you how to perform physical therapy on your dog to help relax stiff muscles and promote a good range of motion in the joints. Your dog may benefit from massage. A soothing massage of the affected area helps relieve stiffness and soreness. Remember, your dog is in pain, so start slow and build trust. Start by petting the area and work up to gently kneading the muscles around the joint with your fingertips using a small, circular motion. Gradually work your way out to the surrounding muscles. Moist heat is also beneficial. A water bottle or soaked towel works best. Going up and down stairs is often difficult for arthritic pets, and for dogs, it can make going outside to urinate and defecate very difficult. Many people build ramps, especially on stairs leading to the outside, to make it easier for the dogs to go outside. Glucosamine and Chondroitin: Glucosamine and chondroitin are two of the supplements that have recently become widely used in treating both animals and humans for osteoarthritis. These products have been around for a while, but due to the lack of scientific studies supporting them and the medical profession's resistance to endorse a nutraceutical, they had failed to gain popularity. Now due to the overwhelming success in treating patients with osteoarthritis, these products have come to the forefront of therapy and are becoming one of the most popular products for treating arthritis today. Examples include Drs. Foster & Smith's Joint Care, Cosequin, and Glyco-Flex. Glucosamine is a major component of cartilage. Chondroitin enhances the formation of cartilage and inhibits enzymes in the joint, which tend to break down cartilage. joint wears abnormally and the protective cartilage on the surface of the joint gets worn away, and the resultant bone-to-bone contact creates pain. Glucosamine and chondroitin give the cartilage-forming cells (chondrocytes), the building blocks they need to synthesize new cartilage and to repair the existing damaged cartilage. These products are not painkillers; they work by actually healing the damage that has been done. These products generally take at least six weeks to begin to heal the cartilage and most animals will need to be maintained on these products the rest of their lives to prevent further cartilage breakdown. Because these products are naturally-occurring compounds, they are very safe to use and show very few side effects. There are many different glucosamine/chondroitin products on the market, but they are not all created equal. We have seen the best results and fewest side effects from products that are formulated especially for dogs and which contain pure ingredients that are human grade in quality. Products such as Drs. Foster and Smith's Joint Care and Gluco-C, or the veterinary-sold product Cosequin are several that fit this category. Polysulfated Glycosaminoglycan (Adequan): Adequan is a product that is administered in an injection. A series of shots are given over weeks and very often have favorable results. The cost and the inconvenience of weekly injections are a deterrent to some owners, especially since the oral glucosamine products are so effective. This product helps prevent the breakdown of cartilage and may help with the synthesis of new cartilage. The complete mechanism of action of this product is not completely understood, but appears to work on several different areas in cartilage protection and synthesis. Buffered Aspirin: Buffered aspirin is an excellent anti-inflammatory and painkiller for dogs. (Do NOT give your cat aspirin unless prescribed by your veterinarian.) It can be used along with glucosamine/chondroitin products and is safe for long-term use. With all aspirin products used in dogs, there is a risk of intestinal upset or in rare cases, gastric ulceration. Because of these problems, it is recommended that if a dog develops signs of GI upset, the product be discontinued until a veterinary exam can be performed. (By giving aspirin with a meal, you may be able to reduce the possibility of side effects.) Using buffered aspirin formulated just for dogs makes dosage and administration much easier. Regular aspirin, Tylenol, and ibuprofen have many more potential side effects and are not recommended without veterinary guidance. Buffered aspirin, or aspirin of any kind, should not be given to cats, unless prescribed by your veterinarian. Carprofen (Rimadyl): Carprofen is a non-steroidal anti-inflammatory developed for use in dogs with osteoarthritis. Carprofen is a very strong and effective painkiller and anti-inflammatory agent. It is a prescription product and because of potential side effects, careful adherence to dosing quantity and frequency must be followed. The manufacturer recommends that periodic blood work to be done on animals that are on this product to monitor any developing liver problems resulting from its use. This product is often used initially with glucosamine therapy and then as the glucosamine product begins to work, the carprofen dose is reduced or eliminated. Corticosteroids: Corticosteroids have been used for many years to treat the pain and inflammation associated with osteoarthritis, although their use now is controversial. Corticosteroids act as a potent anti-inflammatory, but unfortunately, have many undesirable short and long-term side effects. Because of these side effects and the advent of newer, more specific drugs, corticosteroids are generally only used in older animals where all other pain control products have failed, or in acute flare-ups. Corticosteroids are a prescription product and come in both a pill and injectable form. Vitamin C has received a lot of press lately, primarily because of studies done in humans that have linked it to preventing and controlling a variety of diseases. Much of the use in animals has been extrapolated from human medicine. Humans are one of only a handful of species that have a requirement for Vitamin C. Dogs and cats synthesize their own Vitamin C, so this is one area where we probably should not be using human studies as guidelines for treating dogs and cats. We know that Vitamin C acts as an antioxidant and is an important nutrient in the synthesis of collagen and cartilage. We also know that Vitamin C is water-soluble and it is very difficult to create a toxicity. Vitamin C does lower the pH of urine and some researchers question the possible long-term side effects of over-acidified urine. The benefits of Vitamin C in preventing or treating degenerative joint disease are purely speculative. Using reasonable doses of Vitamin C does not appear to be harmful and some day research may show that it is beneficial in animals. Some forms of degenerative joint disease can be treated with surgery. For example, hip replacements in dogs with hip dysplasia are becoming more common. Other procedures can also be performed, but their success rests upon how many bony changes have occurred in and around the joint. Please see the article on the specific joint disease for extended discussion on the surgical treatment options for that disease. Each dog with arthritis will need to have a management program specifically designed for his needs. What helps one dog with arthritis may not help another. Work with your veterinarian and watch your dog carefully so that between you, your dog, and your veterinarian you can determine what is best for your dog. Realize, too, the program may need to be changed as your pet ages, or if symptoms improve.